OK Model 22 fans there is a new kid on the block. The Bersa Thunder Pro series. I have and love my Glocks and carried my Model 31 .357 sig until I got a Bersa 380 Thunder CC. Excellent gun! The gun is accurate, enabling me to shoot 2" groups at 25 yards. So when I heard about the Bersa Pro Series, I jumped at the chance to burn some powder through these. I first ordered the HC Pro 9 for under $400.00. WOW! Full size and accurate. Out shoots my S&W M&P 9mm and my Beretta M9. In my opinion, the best value in a 9mm on the market today. Next I got the Pro UC Series for a concealed carry. OH MY GOODNESS! What a fine weapon, easy to conceal, light, accurate and comes in 9mm, .40, and .45acp. Available in Matte or Duotone finish. The sights can be easily changed (with the right equipment). I prefer the Meprolight Tru-Dot Night Sights. If adjustable is your thing, then the Meprolight TD adjustable set for pistols w/ #8 front and rear sights work great. Am I going to sell my Glocks? NO WAY, but as far as confidence, accuracy, and value, Bersa is making lots of sense. 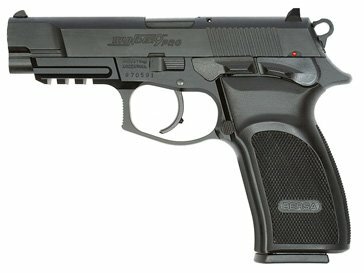 I shoot IDPA and we are starting to see these show up at competitions and holding their own against some high dollar fire-power. If asked about concealed carry, I make available Glocks, Berretta, S&W, Kel-tec and Bersa for folks to try to see if they would like them, and the Bersa's are being chosen more and more. As one lady put it, it just feels good. So if you have some extra cash or have a range that rents pistols, wrap your fingers around a Bersa Pro Series pistol and give it a whirl, you may just have something else to put in your arsenal.